Removes dangerous exhaust fumes by venting your generator above your roof line - not around your campsite! The Motor Home Generator Exhaust System vents generator exhaust above the roof line. An added benefit is quieter generator operation. Perfect for those "close together" campsites. The Camco Gen-turi RV Generator Exhaust System is a venting system designed specifically for RV generators that provides for fresher air around RVs as well as reduces generator noise. 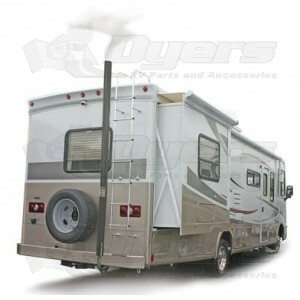 The Gen-turi utilizes a tubing and coupling system to raise generator exhaust above the top level of your RV. It can be used with RVs utilizing virtually any exhaust pipes size by way of a variety of adapters. Exhaust "noise" comes from two sources: vibration and the sound made by the actual gases leaving the exhaust pipe. Most manufacturers mount generators in a manner that uses some type of rubber material to isolate the vibration of the generator. Even though the Gen-turi is rigidly secured to the exhaust system, rubber straps are used to stabilize the Gen-turi to the coach. This prevents transferring the vibration noise of the generator system to the coach. As an added benefit, the noise made by the gases discharging from the generator exhaust pipe is diverted upward, above the roof line of the coach. As a result, in most installations, the exhaust system is actually quieter with the Gen-turi installed. The Camco Gen-turi Air Cooled Generator Exhaust System is designed for near universal compatibility. With that in mind, it can be used with any recreational vehicle that utilizes an exhaust pipe with an outside diameter of 1", 1¼", 1⅜", 1½", 1⅝", 1¾", and 2". Adapters required for 1¼", 1⅜", and 1½" are included. These will accommodate most installations. Adapters required for 1", 1⅝", 1¾", and 2" may be purchased separately. Any recreational vehicle that utilizes an exhaust pipe with an outside diameter of 1", 1¼", 1⅜", 1½", 1⅝", 1¾", and 2". Adapters required for 1¼", 1⅜", and 1½" are included. These will accommodate most installations. The Camco Gen-turi Exhaust System is designed for near universal compatibility. Vents RV generator exhaust up and away resulting in cleaner air for you and your neighbors. Rubberized Gen-turi bungee and eye straps work together to limit vibration and reduce noise. Dissembles quickly when you are ready to hit the road. Wide range of adapters provided. Provided storage bag means no lost parts. Gen-Turi has an overall length of 120"